Review: We begin with a daimon bargaining with a (male) witch for the safekeeping of her child. Nearly seventeen years later, this girl, Mallory, has grown up knowing the dangers of daimons, and training with her adoptive father so she will be able to fight them should they attack. Meanwhile, the majority of daimons live in the City, the only place that the witches left them with. 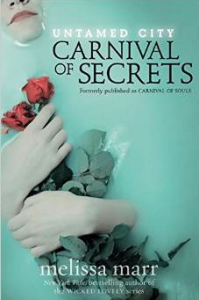 Here, the Carnival of Souls is running, where assassins, prostitutes and others sell their services and goods. There is also a completion in which young daimons fight to the death in order to rule the City. Kaleb is a demon who is in the later stages of the tournament. He also crosses over to the human world looking for Mallory. When he finds her, she starts learning who she really is.I’ve never read any of Melissa’s stuff before, so I wasn’t really sure what to expect in terms of writing quality and such. However, the premises of this was great-how could I not love a carnival full of demons?When we first enter, I wasn’t disappointed. The description is vivid, full of action and Melissa has created a world that I’ve always thought about and loved the idea of. The Carnival is the latest on my list of fictional places I really really want to go to. So much is going on, and it brings to my mind a fantastical gothic Renaissance fair.The modern world seems quite boring in contrast, with not too much going on there at the start. Things soon pick up for Mallory though. I found her a bit annoying, constantly worrying even though she had good reason to, and I felt that she didn’t really do much apart from worry about if the guy she liked would be able to find her after she moved. When he does, and he tells her how he feels, she takes it in a realistic and funny way which made me like her a little more.I really liked Aya. She’s strong, determined and goes against the norm by not wanting to breed (here, daimons need to breed to keep the bloodlines going), instead aiming to rule. Her willingness to kill her childhood friend and ex-betrothed made me like her a bit more. Kaleb is the main male character, and his sense of family and duty offsets the fact that he fights a lot, and fights viciously. Adam is Mallory’s father, who is ridiculously overprotective and he reminds me a little of Nathan from Repo. Zevi is my favourite character of the lot. Fiercely devoted to Kaleb, taking care of him, they have a great relationship between them. The way he reacts when Kaleb goes off and gets himself torn up or signed up for death if something doesn’t happen is both cute and provides a little comic relief.The whole way the daimon competition for ruling is set out is really different but intriguing. I really enjoy this world that’s been developed.Plotwise...the Mallory and Kaleb thing is good, but not my kind of thing. The tournament is more my kind of thing as is Aya’s manipulations of various people to try and get what she wants. It was instalove on Kaleb’s part, which I really didn’t like. I’d like to see Mallory become more integrated with the City in the next book as she tries to learn more about her family. Overall: Strength 4 tea to a novel with a rich setting and a lot of promise.